This study is a continuation of research begun in 1990 with the discovery of the East Continent Rift Basin, a basin filled with Mesoproterozoic (950(?) to 1020 million years old) sedimentary (Middle Run Formation) and volcanic rocks in central and western Kentucky, southern Indiana, and western Ohio. An understanding of this basin is critical in the development of models for the early geologic evolution of the eastern Midcontinent and in relating the basin architecture to earthquake hazards and to assessment of its mineral-resource and waste-disposal potential. Results of the original study are published in The East Continent Rift Basin: A new discovery (KGS Series 11, Special Publication 18 and jointly published by the Ohio (IC 57) and Indiana (Special Report 52) geological surveys). 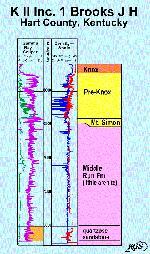 In addition to the recent discovery of a Proterozoic sandstone with natural-gas potential in the central Kentucky part of the basin, an ancient eroded mountain belt, called the Hoosier thrust belt, was discovered lying farther northwest in the English Basin part of the East Continent Rift Basin of Kentucky and southern Indiana. This mountain belt appears to have formed as the result of contraction developing during several episodes of orogeny during the Proterozoic. The thrust and fold structures of the eroded mountain belt also form potential natural gas traps that need to be evaluated by deep drilling. These structures were first recognized in northern and western Kentucky, but recent availability of seismic data in southern Indiana has greatly enhanced our understanding of their distribution. Overlying the fold and thrust structures are two later Proterozoic sequences; the younger sequence shows no contractional structures, indicating the termination of regional compression. An understanding of these deep Proterozoic sequences and their effect on overlying Paleozoic rocks is important to future petroleum resource exploration, CO2 sequestration, and other waste-disposal programs, and in understanding mechanisms that cause earthquakes.